The agenda for Star East this year is amazing. Here are some of the sessions we’re looking forward to. Star East is next week and we are pumped! The TechWell Star East software testing conference in Orlando is one of our favorites (if you’re interested, you can see our list of the Top Software Testing Conferences for 2016). The QASymphony team will be there. Make sure to stop by booth #18 to meet our team and pick up some free schwag. 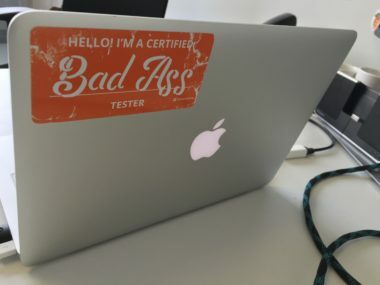 Also, make sure to take our “Tester Personality Quiz” and we’ll give you a laptop sticker with your personality. Keith kicks off the day on Wednesday, May 4th. Keith is a great speaker and has a very interesting background in software testing. Many people don’t know this, but he was an art history major in college (go figure?). Then he went on to become the head of testing at UBS, Citi and Barclays. You can see a recent video interview with Keith on our blog. This will be one of the highlights of Star East so don’t miss it. Mike Cooper is the former Software Quality and Testing Evangelist for HP. This session will focus on the ways testing and development is changing and what software testers need to do to succeed in a fast-moving and highly complex world. It’s always good to come back from a conference with plenty of stats to impress your colleagues. If you want to get the latest updates and research on what’s happening in the industry, don’t miss these presentations. Gerie always delivers highly engaging presentations. The topic for this session should be interesting. A lot of companies buy off-the-shelf software and don’t think about the testing needed. You can read more of Gerie’s insights on our blog. PlayFab and Tania Katan from Axosoft. If you are focused on automation in your job, don’t miss this session. Joe is the undisputed king of automation. Click here to view Joe’s recent QASymphony webinar. I always like attending the sessions with the real practitioners. It’s not just thought leadership. It’s a true view into what’s really going on within a testing department. This session from David Bialek looks very interesting because it’s focused on analytics. This is a must-see for anyone who is swimming in data but thirsting for knowledge. There will be two speakers from Comcast at Star East. Their sessions are below. Given all the technical issues and complaints people have with Comcast, these sessions should be fascinating to watch. This session sounds very interesting and Stephen is from our hometown of Atlanta, GA. So we’re a bit biased and wanted to give him a plug. I hope that gives you a good list of sessions to check out at Star East 2016. We hope to see you there! Testing Is Changing, and That Is a Good Thing! Published at DZone with permission of Jeff Perkins , DZone MVB. See the original article here.